Students will obtain hands-on experience with innovative techniques in both neuroscience and immunology; including isolation and identification of cells contributing to cellular inflammatory responses, in vitro models, induced pluripotent stem cells (iPSCs), cellular imaging, fluorescence activated cell sorting (FACS), electrophysiology, biochemistry, qPCR, in vivo high resolution cellular imaging, bioinformatics. Over the last 2 decades it has become abundantly clear that the brain mounts robust inflammatory responses, mediated locally by glial populations including microglia and astrocytes. As more and more data emerge from genome wide association studies of neurodegenerative and neuropsychiatric conditions it is evident that neuroinflammation is a key player in brain function and dysfunction. As a result there has been an explosion of interest in neuroinflammation and in the tools available to study these processes in the brain. Interrogating these pathways will be one of the key battlegrounds of 21st century neuroscience. To reach this challenging goal, expertise in neuroimmunology is necessary to identify the cellular and molecular mechanisms of neuroinflammation to understand how it participates in brain disease. This represents an exciting opportunity to potentially treat or even prevent neurodegenerative and neuropsychiatric disorders. Neuroinflammation research relies on a large array of different techniques. Recently, there have been numerous advances in both the basic biological knowledge and the methodologies to study microglial cells and/or invading immune cells into the brain. 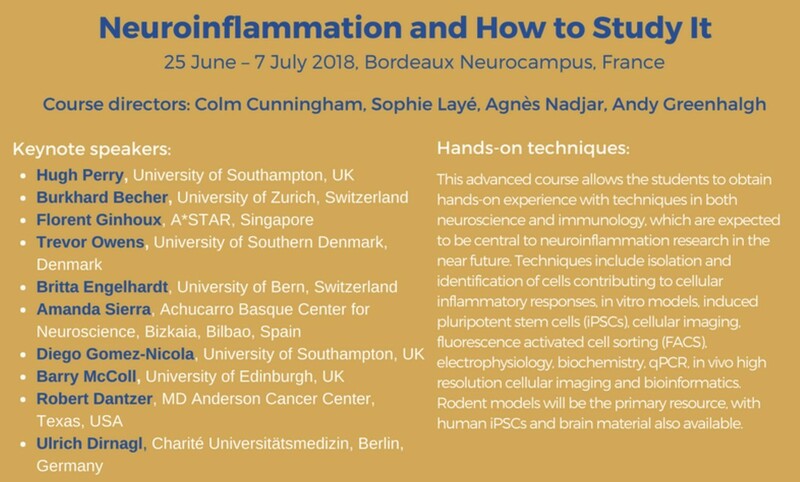 This advanced course allows the students to obtain hands-on experience with techniques in both neuroscience and immunology, which are expected to be central to neuroinflammation research in the near future. Techniques include isolation and identification of cells contributing to cellular inflammatory responses, in vitro models, induced pluripotent stem cells (iPSCs), cellular imaging, fluorescence activated cell sorting (FACS), electrophysiology, biochemistry, qPCR, in vivo high resolution cellular imaging and bioinformatics. Rodent models will be the primary resource, with human iPSCs and brain material also available.